I consider myself pretty religiously progressive, not just within my faith, but also in my attitude toward the way secular culture treats my faith. I know that, while Christmas is a Christian holiday, many other religions have celebrations around this time of year. Furthermore, Christmas has been adapted to be more secular, so that non-religious folks can share the love and give gifts without all the religious bits. I get it. I’m okay with it. I understand, but there are certain things I find inappropriate. I love geeky Christmas things. 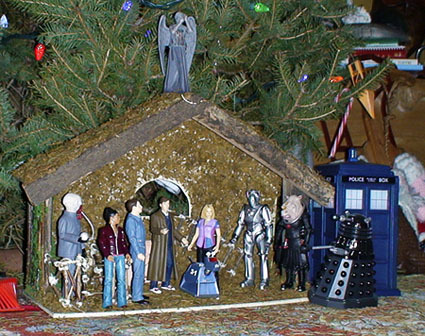 Daleks in Santa hats, superhero Christmas ornaments and stockings—I love it all, but I do feel offended by the geek nativity scenes. The nativity scene is something that obviously indicates religion. By having a nativity scene, you are saying that the holiday you are celebrating has a religious bent to it. A nativity says that you are celebrating Christmas as a Christian holiday. Like I said, I am aware that Christmas shares this holiday with others. I know that Christ was probably actually born in the fall, and that both to appropriate pagan Yule celebrations and for other religious reasons, the early Church decided that Christmas would be celebrated in December. But that doesn’t negate the fact almost all Christians are celebrating the birth of Christ this month. 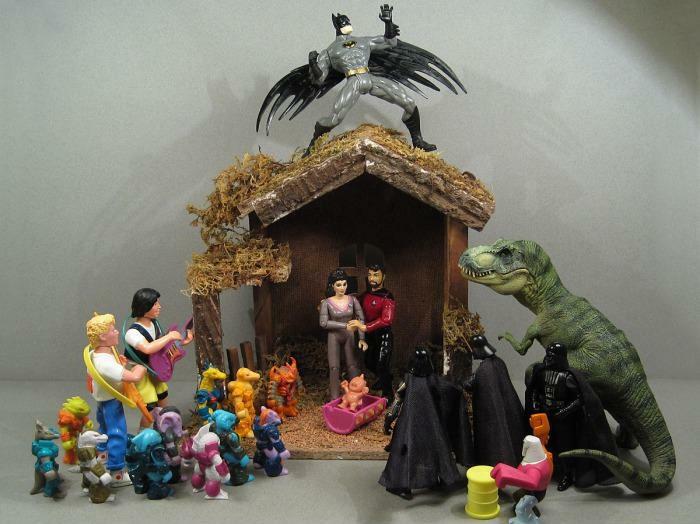 To me, when you aren’t Christian but are making these geek “nativity scenes,” it says to me is that you are mocking my religion. By putting K-9 in the place of Jesus, Wonder Woman as Mary, and Obi-Wan as Joseph, or replacing any other religious figures with geeky ones, you are saying that you find these extremely important religious figures to be laughable fictional characters that are easily replaceable with any fictional character. It says that my religion is nothing more than a nice, and maybe mildly entertaining fairytale, and the figures in it are easily exchanged for any other fairytale character. It’s not real, so what’s the big deal right? But to me it is real. To many other people in the world these stories are very real, and while I’m not a Biblical literalist (meaning I don’t believe that everything in the Bible actually literally happened), that doesn’t detract from the powerful messages and symbolism in the nativity scene. 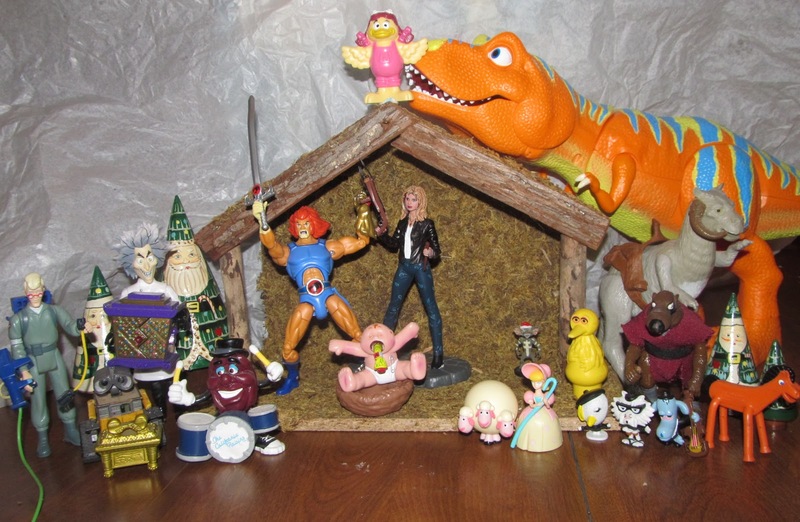 So before you post your oh-so-funny ThunderCats nativity scene on Tumblr, maybe stop and think for a moment. Mocking someone’s religion, no matter what the religion, is never appropriate. 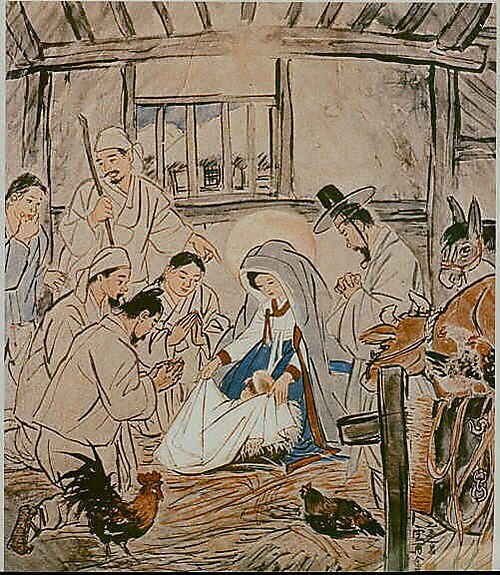 Beautiful image of the nativity from China. This entry was posted in Geek, Holiday, Religion and tagged Christianity, Christmas, geek, geek culture, Nativity, Religion by Lady Geek Girl. Bookmark the permalink. Hmm… I wonder what you’d think of these ones: http://whyismarko.com/the-50-worst-and-weirdest-nativity-sets/. Some of them are as irreverent as the ones posted here, but some are just ingenious (I like the packaged food one XD). Small correction on the last nativity scene you show in your post. The painting is actually Korean, not Chinese. The painter’s name is Kim Ki-Chang.